If you aren't, you will save so much time and money at the grocery store buying things that aren't needed. This week my hubby asked why the grocery list was so small, probably like you, our pantry is overflowing with food items that never get used. But also, I don't like to spend a lot of time in the kitchen making complicated meals but I still want the food to taste delicious. 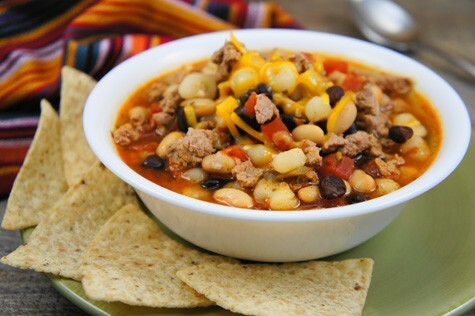 This is another one of our family favorite soups and is very filling and fast to make! In crockpot or large kettle, add meat and sprinkle seasoning packets on top. Add entire contents of the canned ingredients - do not drain the juice! Stir until mixed and and cook on low for 2 -4 hours in crockpot or on stovetop until hot. Feel free to add shredded cheese and a dollop of sour cream.